If you have been told to use interdental brushes, then your hygienist or dentist will have suggested that you do so, because there are signs of food and plaque building up in-between your teeth. 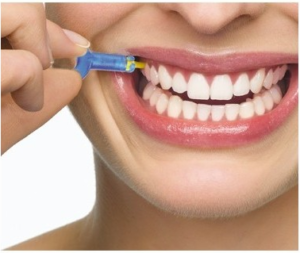 Interdental brushing can help you to be able to get rid of any bacterium that sticks in the middle of teeth. It is a great way to avoid gum disease, bad breath, and irritable gums. When plaque builds up it also creates callcus and that can make your teeth discoloured, and also makes your teeth painful – allowing cavities to form faster. Plaque builds-up as you eat and brushing with a normal tooth brush will not allow you to reach in-between the teeth. Interdental brushing is a great method of keeping your teeth fresh, and cavity free. Interdental brushes have been designed to be thin enough to get in-between the gaps in your teeth. You can pick them up from pharmacies and they are on offer in different sizes. Depending on the gaps in your teeth, you may need to use different sized brushes. To begin with it may be a little bit awkward and it may cause your gums to bleed. Usually this is because your gums take time to get used to the process and if you have not brushed in-between the teeth before, other than your regular check-ups at the dentist, then you may have a lot of build-up and it can take a while to remove this. Your dentist will be able to offer you some sound advice about how to brush with interdental brushes correctly. Be gentle and do not force the brush inside the teeth. If you force it, it will hurt! You should try and make a pattern to get used to, and make a habit, making sure that you go around the entire mouth and remove any dirt that is there. If your gums bleed and get tender, then this is a good indication that you are removing plaque build-up, and most probably preventing yourself form having any fillings further on down the line. If you do notice that the bleeding does not stop after a few days of using the brushes, then seek dental advice and your dentist or hygienist will be able to advise you the right, and the wrong way of using interdental brushes. It can be difficult at first and if you do find it hard, again, do not be scared to ask your dentist, he or she are there to help. Here at VitaSmile we pride ourselves in being able to share our expert knowledge about teeth with our patients. Dental floss can still be used in conjunction with interdental brushing. If you really cannot use the brushes then you can use floss on its own. However, it is usually the case that people find flossing harder than brushing. Talk to a member of the VitaSmile team today about interdental brushing.